The map above shows the location of the possible reentry of the space junk EPSILON R/B (43939U) predicted by modeling of orbital evolution until the fragment or satellite reaches the altitude of nominal burst. 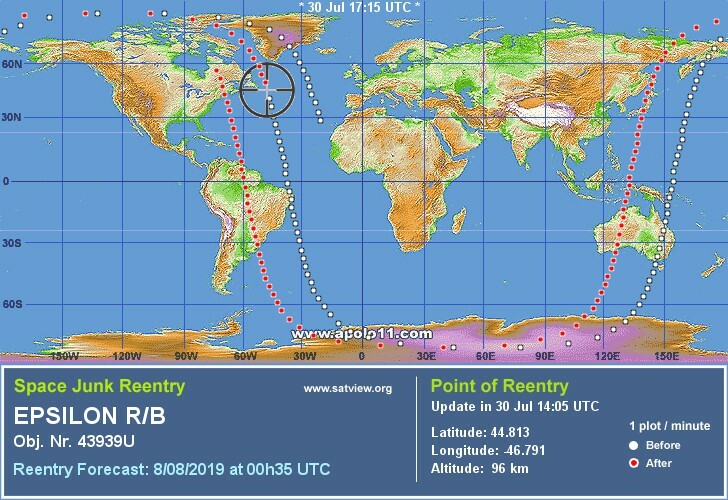 According to the forecast made by Satview.org, the object's reentry will occur in Saturday, 13 Jul 2019 at 17:34 UTC, above the coordinates shown on map. The second map shows the location of the reentry like predicted by USstratcom (United States Strategic Command).